I joined these guys for 8 days, and made some money. Between the 7th and 8th day they made like 25 long trade, for bigger and bigger amounts with no stop losses, and lost my entire account of $2,800 in 24hours. They must be shut down, I can't believe this!!! If you check your own results, you will see what happened. I see on your results you guys lost like %98 percent of your account too. I have been a member of www.sterlingfx.co.uk for about 3 months and am overjoyed with the level of service and performance more than doubling my account. 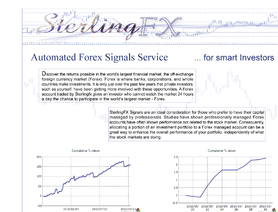 I have been a member of so many services prior to this and had almost given up on forex as an extra income.